Ideally completing aircraft commnunication management systems, the IC3100 amplifier is a robust self-contained unit optimized for high-noise conditions. It provides intercom connectivity between flight deck and passengers while supporting a wide range of different microphones and heasets. Mission-specific concerns in aircraft installations need operational and customer-centric solutions. The IC3100 Intercom Amplifier is a smart way to enhance your aircraft communication management system. 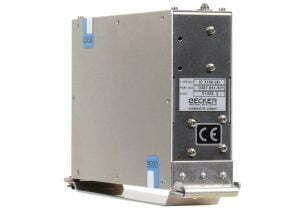 It is specially designed for intercom applications in aircraft with high noise conditions. The IC3100 supports intercom capability in the cabin and on the flight deck and between the passengers and pilot/co-pilot. The amplifier is equipped for connecting up to six headsets with hot mike mode. Designed as a mono-block device with a compact and smooth design, the IC3100 is well suited for installations in the avionics compartment of various types of aircraft.